Guido Guerrieri is a defence counsel lawyer living and working in the city of Bari on Italy’s Adriatic coast. He runs his own small but successful office with a team of loyal staff and has plenty of business to keep things ticking over nicely so when an old friend, a criminal lawyer, asks him to take on some work that he feels is not his area of expertise, Guido reluctantly listens to what he has to say. A young woman, a student from Bari but living in Rome has gone missing and, with little to work on, the police are about to shelve the case. Manuela’s family hope that Guerrieri can run a legal eye over the paperwork and spot any errors in the police handling of the investigation that might give them the leverage they need to get the case re-opened. Guido’s enquiries hinge on the hope that one of the witnesses – the missing girl’s friends, her ex-boyfriend or someone employed at one of the train stations she may have passed through – recalls something they had previously overlooked or considered irrelevant, and before long Guido is convinced that someone isn’t telling the truth. But who is that, and what is it that person is hiding? The novel is seemingly light on plot and offers little for armchair detectives who might be able to formulate their own theories but shouldn’t look too hard for clues. We’re led through the chronology of Guido’s enquiry and sit in on his interviews but we don’t get much of an insight as to where he thinks the investigation is taking him. Plot-wise it’s tight but with such a simple story there’s little to go wrong. What it lacks in plot, though, is more than compensated for with intriguing characters and an atmospheric backdrop. Just the right amount of detail about the Italian legal system is woven into the story, any more might appear laboured and while the detail doesn’t add anything to the plot development it certainly adds to the landscape. Carofiglio writes beautifully; each character is well drawn despite the economic use of language and none are superfluous to the plot. His fine evocation of the edgy Italian port city does much to distract the reader from the rather lightweight storyline. Author Gianrico Carofiglio was previously a prosecutor in the Puglia region and it’s obvious that this background has provided a credible and authentic voice to the narration. That he writes well is undeniable; the characters are credible and colourful, the backdrop at once beautiful and slightly seedy. It’s a shame, then, that the story here does not reach the heights Carofiglio manages to scale in setting the scene. I found the novel engaging, but not because the story was particularly compelling or suspenseful. Anthony Shugaar’s translation appears to work, though not having read the novel in its original Italian it’s difficult to be sure; there’s certainly not, though, any of the clumsiness that can come with a poor translation and the dialogue in particular flows naturally. I’m sure I’ll make another date with the gorgeous Guerrieri; there’s something attractive and engaging about the character that makes him stand out from the usual crowd of grumpy middle aged investigators so beloved of contemporary crime fiction authors, and I want to know more about him. The crime element is a let-down, at least on this outing, but I found the character so interesting that actually the somewhat tame investigation paled into insignificance. One for Italophiles(?) rather than crime fiction fans perhaps, but an enjoyable read all the same. 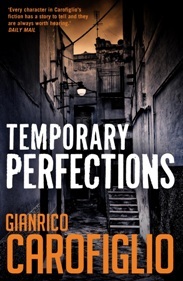 One Comment on "Temporary Perfections"
If you liked Temporary Perfections, why don’t you try the other novels in the Guerrierri series: “Involuntary Witness”, “A Walk in the Dark” and “Reasonable Doubts”?